#75 - Covers by others and others and others...You Pick The Playlist returns with Seanic Boom aka Sean Mitchell!! Over the years of doing a radio show, a lot of people have come up and said "oh man, it would be so cool to do a show" or "I wish I could do what you do". So that got CabaRadio to thinking...why not give you the chance to do just that! That's when we came up with the idea of 'You pick the Playlist' a show where you, one of our listeners gets to come on the show and pick the music for the night. Not only that but you get to talk about why you wanted it played, or what it means to you, or hell maybe you just really dig the song! Maybe you want to play an 80's set, or a punk set, maybe you are like us and you wanna play a whole bunch of different music all on the same show or maybe just maybe you are a musician and you wanna showcase all your own stuff, you can do that to...it's your Playlist! Their are a few rules of course, like you have to play some Canadian Content aka CANCON and you have to play some female content aka FEMCON but other than that, the mic and music is all yours. 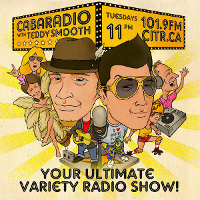 Join us tonight http://citr.ca/ at 11pm as CabaRadio listener, and YPTPL alumni Seanic Boom returns! Last time Seanic brought us covers by others, songs you thought you knew by one artist but in fact were originally done by another. Tonight, we welcome back and say farewell to Seanic Boom as he sets off to travel the world! Join us for another exciting batch of covers by others! Tune in to hear Seanic Boom aka Sean Mitchell as he becomes CabaRadio's DJ for the night!! PS if you would like to Pick the Playlist some night on CabaRadio please email us at cabaradio@gmail.com with the subject "I wanna pick the playlist" We do it every couple of months, so sign up now and start picking your list!